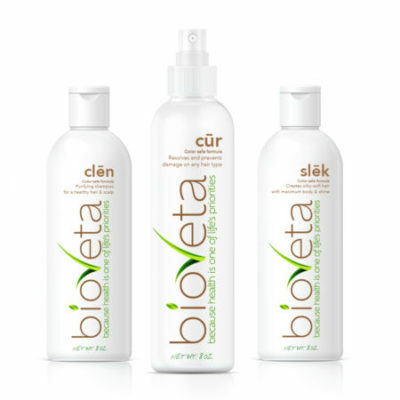 Bioveta dezīn provides the hair styling foundation for any and all hair types. dezīn establishes “air in the hair” lift from the roots up, adding softness, control and shine. The more you use the more it holds from simple to high maintenance hair styles. You decide how much to use for light or heavy hold effectiveness. dezīn provides fine, medium and coarse hair weight comfort control depending on your hair type and desired feel. dezīn protects your hair from styling heat damage, smooths hair frizz and won’t dull your color or shine. Great for that wet head look when following up with a few spritzes of kep to lock in your style. Bioveta dezīn brings life to the hair’s root, making it the ultimate finishing product for voluminous, full-bodied hair. Protect hair from heat damage and smooth hair frizz without dulling your color or shine. Spray a few spritzes throughout the hair and dry or style as usual. Use a little more or a little less as needed. Lock the style in place with kēp. It’s the ultimate finishing product for every style and hair type.